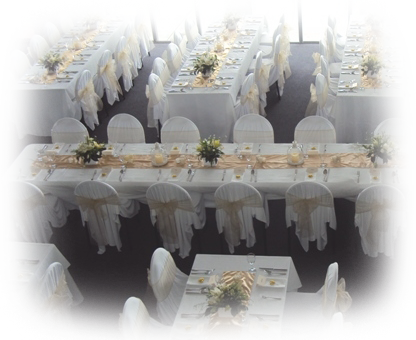 Located on Ellwood Park at the corner of Elwood and Otene Roads, the function centre offers a raft of opportunities for both indoor and outdoor functions. Ellwood Function Centres is keen to discuss requirements for any event genre. Venue hire includes the use of the following equipment at no additional charge. Ellwood has a commercially appointed well sized kitchen suitable for all styles of catering. Catering options are numerous in Hawke's Bay and Ellwood will work with clients to secure catering services to meet every clients need. For large functions Greg Miller of Feed Catering and Valley D Vine is our preferred supplier, in-house catering is available for smaller functions. Greg and his team consistently deliver well executed menus using local produce to delicious effect. From Cocktail parties with hundreds of guests to small family functions Ellwood will secure a catering company to meet your needs. Leave the subcontractors to the efficient and professional team at Ellwood Function Centre their contacts are many and experience broad.